There are so many great things I want to do with my children, but we are held back by a lack of planning and organization. This is the next big area I am tackling in my journey toward living a prepared life. I have recently discovered a series of books by Trish Kuffner that are full of creative activities for kids, using things I have around my home. I LOVE these books. You really need to check them out. 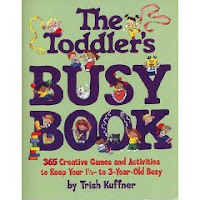 The Toddler's Busy Book - This book has great ideas for activities to do with your one-and-a-half to three year old that stimulate creativity and learning, not to mention stave off boredom on long rainy days. 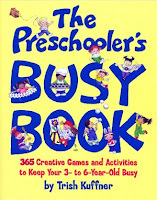 If you have older kids, she has also published The Preschooler's Busy Book geared toward three to six year olds. Most of this book is still too advanced for my not-quite-three-year-old, but I enjoyed reading it for additional inspiration and a picture of the soon-emerging skills to watch for in my children. For children six to ten there is The Children's Busy Book. I haven't read this one at all. 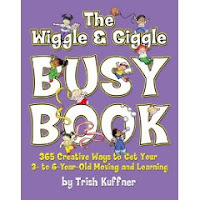 Another great book is the The Wiggle & Giggle Busy Book. I have only read a few sections in this book so far, but I am finding great games to play with my kids. These ideas have really helped on rainy days, when we can't get outside to run around. All of her books have large "Rainy Days" sections to help with those 'stir-crazy' days. I have been so inspired by these books. There is a great section in the beginning of each book that lays out how to organize your home to meet your child's changing needs. You will have to stay tuned to find out how well I am able to implement these great new ideas into my daily life.